The Social Security baby names page shows Emelia and Khaleesi as names that increased in popularity. Emelia, as in Clarke, jumped 28 places to 74th. Khaleesi, the title of her "Game of Thrones" character, was less popular but enjoyed a greater jump from 765th to 630th, 135 places. Unfortunately, Daenarys, her character's actual name, didn't crack the top 1000. Oh, well, two out of three isn't bad. She'll have to settle for the holiday art/meme I used to illustrate this entry. Khaleesi/Clarke wasn't the only "Game of Thrones" character and actress to have her names become more common in the U.S. Arya, as in Stark, also became more popular, rising 34 places from 169th to 135th. The character's actress's name, Maisie, as in Williams, also enjoyed more popularity, gaining 50 places from 574th to 524th. Sandel mentioned that Clarke also plays a role in the upcoming "Solo: A Star Wars Story," which brings me to the subject of Star Wars names. Quartz has more in Star Wars baby names are on the rise. When it comes to seeking baby name inspiration, lots of people turn to Star Wars movies. Unfortunately for Kylo, which was the name that increased the most in popularity in 2016, it was the name that dropped the second most in popularity in 2017, 245 places from 904th to 1149th. The character's real name, Ben, fell 26 places to 729th place. To add insult to injury, the actor's name, Adam, also fell two places to 77th. On the other hand, Rey as a male name increased in popularity 99 places from to 769th. As a female name, it didn't crack the top 1000. The actress's name, Daisy, also became more popular, rising 20 places to 170th. Leia also continues to rise in popularity, rising 43 places to reach 279th. Oh, and Finn climbed eight places to 167th. I take all these as signs that the Light Side is prevailing over the Dark. Logan as a boy's name, which rose 13 places from 18th to fifth, wasn't the only superhero name to increase in popularity. As a girl's name, Logan leapt 92 places to 292nd. Wonder Woman's real name, Diana, climbed 39 places to 230th. Harley, as in Harley Quinn, increased in popularity as both a boy's name and a girl's name, the former 25 places to 650th, the latter 22 places to 202nd. In addition, two of its variants became more common. Harleigh jumped 74 places to 877th and Harlee rose 17 places to 622nd. Also, Margot Robbie, the actress who plays the Joker's paramour, saw her given name leap 72 places to 361st. Finally, Bruce, the given name of both Batman and The Incredible Hulk, climbed eight places to 431st. I finish the examination of names inspired by entertainment with three names that have nothing to do with speculative fiction, but are worth noting nonetheless. Melania, the name of the First Lady, skyrocketed 720 places to 930th place. Meanwhile, Donald didn't budge at all, remaining at 488th place. Finally, Xiomara, the name of Jane's mom from "Jane the Virgin," returned to the top 1000 in 848th, bouncing 176 places. I doubt anyone else caught that, but I don't know how many people both pay attention to baby names and to "Jane the Virgin." Who knows, it might just be me. 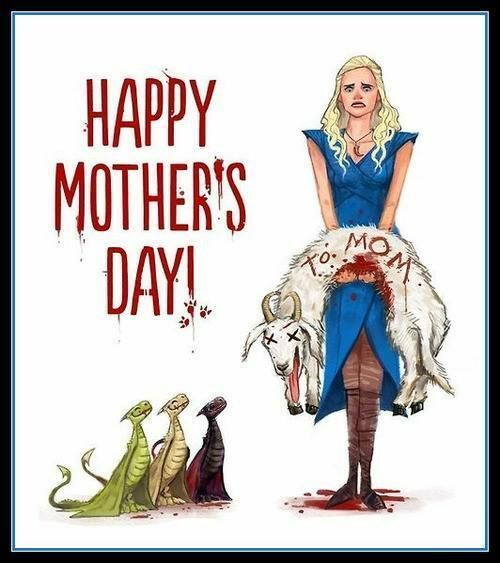 I conclude by returning to the intersection of Mother's Day and "Game of Thrones" with "Game of Thrones" Inspired Mother’s Day Gift from Jimmy Kimmel Live.